Headstone of Abijah Bigelow--Revolutionary War soldier. # 15578. Abijah 5 BIGELOW, son of Jacob 4( Thomas 3 , Samuel 2, John 1) BIGELOW and Susanna (MEAD) BIGELOW was born 16 April 1756 in Waltham, Middlesex county, MA. He served in the Revolutionary War, and in his old age claimed pension. The application contains a vivid description of the Battle of Bunker Hill. (see note) He was married, on 30 November 1780, to Mercy Amelia Spring, daughter of Converse and Mercy (Learned) Spring. She was born in Watertown 28 February 1761, and was niece of the well-known physician, tory, and politician Marshall Spring. They lived a number of years at Waltham, then in 1796 moved to New Braintree until 1808, when he moved to Barre where his brother Samuel lived. In 1817 he moved to Leicester, MA, and after a few years to Brooklyn, CT. In 1836 he moved to Indiana, founding Bigelow's Mills, where his wife died 20 August 1846. In 1848 he moved to Michigan City, IN to live with a daughter. He died there 22 October 1848, at the ripe old age of 92 years, 6 mos, 6 days. 1790 census: MA-Middlesex-Waltham-Abijah Bigelow: 2-1-6-0-0. Biglow, Abijah, Waltham. Private, Capt. Abraham Peirce's co., Col. Thomas Gardner's regt., which marched on the alarm of April 19, 1775, to Concord and Lexington; service, 3 days. Biglow, Abijah. Corporal, Capt. Caleb Brooks's co., Col. Brooks's regt. of guards; enlisted Nov. 3, 1777; roll made up to Feb. 3, 1778; service, 3 mos., at Cambridge; also, Sergeant; pay roll for service from Feb. 3,1778, to April 3.1778, 2 mos., at Cambridge. Biglaw, Abijah, Waltham. Private, Capt. Abraham Peirce's co., Col. Samuel Thatcher's regt; pay roll for service from March 4 to March 8, 1776, 5 days; marched by order of Gen. Washington at the taking of Dorchester Heights. 15578.1 Nabby, b 29 Sept 1781; d 7 Apr l802. 15578.2t Sally, b 6 July 1783; d 29 Jan 1826 Petersham, MA; m 30 Nov 1806 Rev. Luther Willson. 9 children. 15578.3t Marshall Spring, b 20 Jan 1785; d 28 Apr 1847 Leicester, MA; m (1)1 May 1811 Olive Stone Sparhawk, by whom 2 children, and (2) Sep 1819 Lucinda Caldwell, by whom 2 children. 15578.4 Zibiah, b 15 Oct 1787; m at Barre 4 May 1812 Rev. John Nelson. No issue. 15578.5t Jacob, b 26 Aug 1790; d ____ at Washington DC, m 31 Oct 1820 Eliza Southgate. 3 children. 15578.6t Abijah, b 16 Aug 1792; d _____ Cincinnati, OH,m (1)13 May 1824 Susan Maria Phelps, by whom 2 children; and (2) 30 Jan 1834 Rebecca Edwards Ogden, by whom 5 children. 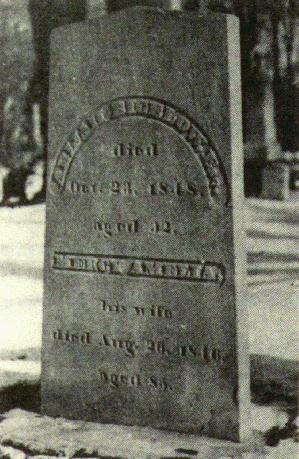 15578.7t Mercy Amelia, b 4 Oct 1794; d _____ ; m 12 May ABOVE: headstone of Abijah Bigelow,1823 Horace Dickenson. 5 children. Revolutionary War soldier. 15578.8t Lucy, b 11 Apr 1797; d 6 Aug 1890 Michigan City, IN; m 19 Aug 1822 Herbert Williams of Leicester, MA; b Hopkinton, MA and graduated Williams College 1807, ordained 1812 and was pastor at First Church, Leicester, until 1871, a period of 59 yrs, 9 mos. 5 children. 15578.9 Increase Sumner, b New Braintree 25 May 1800; d 11 Sep 1804. 15578.A Nabby, b 18 Aug 1802 New Braintree; d 11 Aug 1816 Barre. 15578.Bt Increase Sumner, b 21 Sep 1805 New Braintree; d ____; m 27 Aug 1837 Hannah P. Bell. 6 children. 15578.C Susanna Stimpson, b 13 July 1808 Barre; d 27 Feb 1809 Barre. account if you have it. P. S. I am using my wife's email address. FORGE, The Bigelow Society Quarterly; Vol. 5, No. 4, Oct. 1976.